This is the Wesco 10” Highliner in brown. These climbing boots are ideal for those of you who like to take some time to find yourself out in the wild. These beautiful highliners come with a 100 Vibram lug sole to aid in grip as you traverse rocky outcroppings and fallen trees out and about. With 7 oz. full-grain leather, these beauties are of the highest quality build. Climbing has never been easier with a non-corrosive steel shank embedded in the boot to aid in comfort and give your feet the maximum amount of support possible. 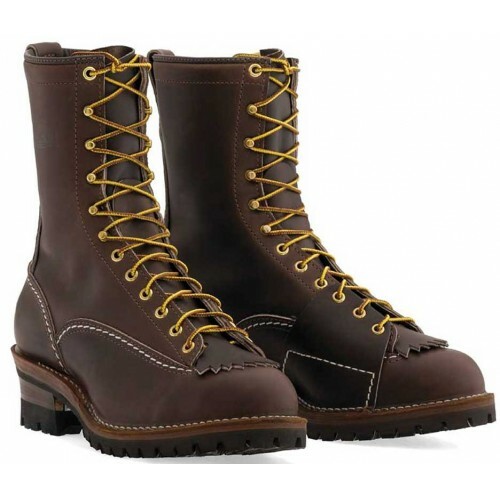 Whether you are hanging from the side of a steep cliff or just walking about in the city, you can count on these boots to always be hardy in the face of use. These Wesco beauties also come with a removable false tongue which you can place behind the laces for protection to increase the lifespan of your boots. Wesco has always produced the highest quality boots, and these are no exception. For those of you looking for a less “earthy” look to your boots, check out our Black Highliners.